inside workplace wellness: Sharing. Exchanging. Social Health. On Monday, I attended the #sxsh conference -- Sharing. Exchanging. Social Health. I was really out of my element which made me think. (I spent part of the time just trying to keep up with the acronyms being tossed around.) I liked the TED style of the conference and it was a tremendous value -- $50 for a full day of learning in a pleasant environment from an impressive group of presenters. These were some of the highlights for me. Todd Park, CTO Heath and Human Services, delivered the keynote address. He was held out as "better than coffee" first thing in the morning and he didn't disappoint. He spoke energetically about new incentives and a shift from a fee for service system to one that pays for health, quality and value. He talked a bit about integrated delivery systems and suggested there will be a range of approaches that will motivate and reward innovation prompted by projects like the CMS Innovation Center. Then he moved onto discussing information integration like the Blue Button Initiative and the Direct Project. A project to create the set of standards and services to seamlessly and securely transport health information. A note I starred -- fuel with data to spur change. (I can't help drawing analogies between healthcare and Moneyball this week with the movie coming out.) A list of initiatives he mentioned that I want to take a look at -- iTriage, Healthline, Castlight, patientslikeme, Asthmapolis, Food Oasis, and Ozioma. Jane Sarasohn-Kahn, previously known only to me as @healthythinker, suggested that people are adopting a DIY approach in this post-recession economy that extends to healthcare. There has been a lot written about people self-rationing care during an economic downturn, but Jane brought a different perspective. She kindly summarized her talk on her blog, (which is on my routine reading list) so you can get this great info directly from the source -- Peoples’ home economics are driving DIY Healthcare. Kent Bottles, M.D. gave a presentation on Grassroots Mobilization. He talked about patient advocacy and the success of the Avastin campaign by breast cancer patients. Of course, Avastin was not ultimately approved by the FDA for use with breast cancer, but you can still appreciate effectiveness of the grassroots campaign by patients and their supporters. Dr. Bottles suggested that we would all benefit from a social approach to recruiting for clinical trials. He shared that cancer patients get half of what their doctors tell them wrong and talked about CareCoach.com a service to help people prepare for conversations with their doctors and even record them to revisit or share with family members later. A lot of doctors decline to have conversations recorded at this point, but Dr. Bottles predicts it will be like using video in police cars, someday doctors will come to appreciate the value of the transparency. At lunch time, we witnessed the launch of Is My Cancer Different. We were told, "If you've seen one cancer, you've seen one cancer." This is a campaign to educate people with cancer to request advanced molecular-level testing so treatment can be targeted. There is a very compelling and passionate group of people behind this initiative. 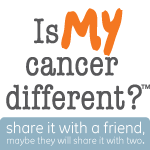 If you know someone with cancer, encourage them to visit the site and talk with their doctors about molecular-level testing. I was hoping to meet more of the #co_health group IRL, but I did enjoy seeing Fran Melmed (@femelmed) and hopefully a few of the #sxsh folks will join in our chat today at noon on games and engagement. Dave deBronkart, aka e-Patient Dave, shared his story and made a compelling case for increasing consumer involvement in healthcare. His story seemed to illustrate why we were all there. Take a few minutes, 16 to be more exact, and watch his TEDx Talk from earlier this year.